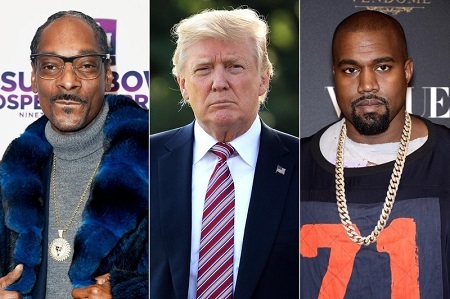 Snoop Dogg has a message for Kanye West and all those who support Donald Trump. While appearing on DJ Suss One's SiriusXM show earlier this week, the rapper got very heated when the DJ suggested some of his fans were Trump supporters. "I tell them straight up motherf ---," the rapper said to the host, imploring him to make it clear to his fans they are racist. "If you like that n--, you motherf --- racist. F- you, and f- him." The 46-year-old rapper went on to explain how the President "drew the lines," causing tension between people of different racial and socioeconomic backgrounds. "Before him, there were no lines, Everybody was everybody, we respected everything, we did not trip," he said. "But n--, when you drew the line, n-- started pointing mother --- out ... f-- you n--." Snoop then called West for publicly supporting Trump. "Kanye too, n-, do not forget about him too," Snoop said. "F- him too, I'm going to throw him in the bag too because I've right with them motherf ---."